The contest ended at midnight on Feb. 14th, 2014, Valentine’s Day. None of the goals and rules were met 100%, however: Facebook and Twitter goals were crushed–nice job–but LinkedIn and Instagram goals came up short to qualify for any rewards. Not to be a complete jerk for those of you who helped crush the Facebook and Twitter goals below, I’ll give away 2 signed limited archival ink prints out of the original 5 I promised, #s 46-50. They’re signed by each member of the band that recorded “Rot Gut, Domestic,” and certified/numbered by me. I’ll pick the winners from a hat and document it with a video online after I do my best to collect all the names who participated and left me comments at all the social media links provided to qualify. I’ll announce those winners end of Feb / early March 2014. 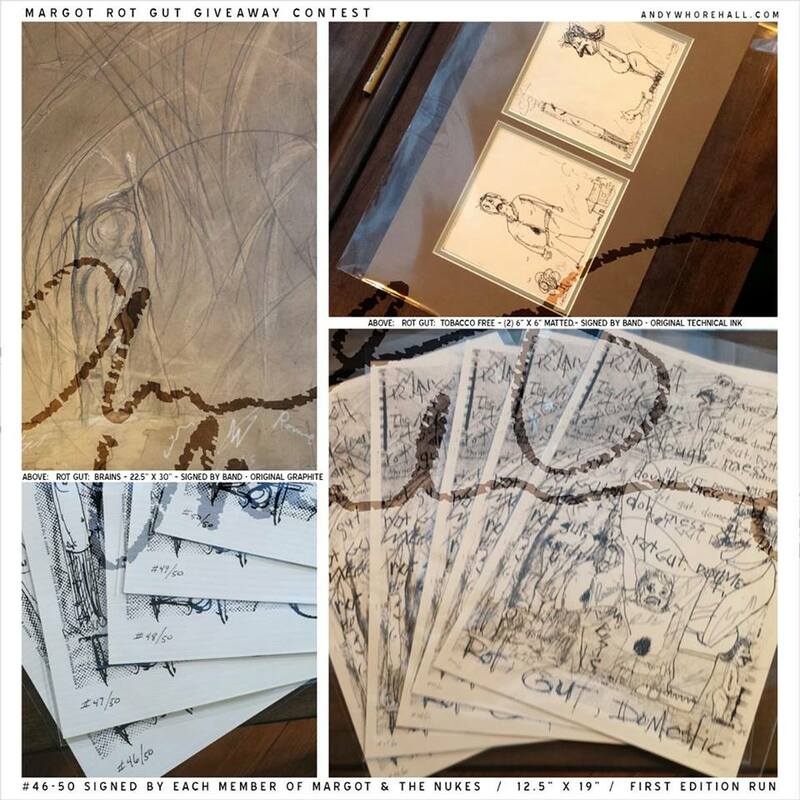 Margot & the Nuclear So and So’s is releasing the beautiful “Sling Shot To Heaven” (PRE-ORDER CLICK HERE NEED BE) this spring, so I’m throwing a ROT GUT ART CLEARANCE CONTEST. You have till February 14th, 2014, midnight, to achieve these goals below to win signed artwork by the band and I. All you have to do is follow the rules and share this contest to qualify to win–sign your name in the comments section below, or on the Facebook page post (you can’t miss it, top of the page), and good luck, y’all! 1) Get my Andy Whorehall | dD facebook page to 2,500 imaginary “Like”s, my Twitter & Instagram accounts to 500 fictional followers, and my agent’s LinkedIn to 600 connects and I’ll give away (5) “Rot, Gut, Domestic” archival ink prints–signed by the entire band with me in 2012 and numbered, limited, only 50 exist. 2) Get my Andy Whorehall | dD Facebook page to 5,000 Page “Like”s, my Twitter & Instagram accounts to 750 fictional followers, my agent’s LinkedIn to 700 connects and I’ll also give away the prints plus (1) of the original ink sketches of artwork from the making of Margot’s ‘Rot Gut’ record: Tobacco Free (Original, Signed By Band). 3) Get my Andy Whorehall | dD page to 10,000 drunken “Like”s, my Twitter & Instagram accounts to 1,000 followers, my agent’s LinkedIn to 1,000 connects and I’ll give away all of the above prizes as well as an original graphite illustration produced for Rot Gut, Domestic: “Rot Gut: Brains (Signed By Band and me). 22.5″ x 30” / A $1492.00 value, the year Christoper Columbus discovered my ocean blue. Everyone that follows the rules above, connects with all of the above links, leaves their name below in the comments, and shares this post. That’s that. Everyone has a chance to win but me while I continue to lose more of my precious little babies to you while we all celebrate more of nothing on the internet together. (Why would I do this you wonder? It’s simple if you think about it for a few hours while reading a book that doesn’t require batteries. You see, I enjoy wasting more of our time on the internet together. For me it’s research to create more garbage in the future with my hands before the sun turns off and the satellites drift away while server grids collide leaving many of us helpless, cold, and reliant on our own survival skills. Skills that are far removed from internetland. Do you feel me? You don’t? Think about it. I’m sick and fed up with all of you; your lack of passion, drive, and abilities to use your own brains, eyes, hands and feet to do anything for yourselves without counting on Lady Mac or the internet to guide you. Shame on you; you dirty, worthless, breeding organisms. Come on! Get good and angry with yourselves! Now do you understand? Good! Moving on towards the end of everything. Now go on out there with your laptops, smartphone and tablet devices, and share away to win– don’t forget to charge your batteries! 8 comments on "Margot & The Nukes Contest – 2014 – Free Art"
Shared & connected to all. What’s up with this Andy? Contest ended, none of the goals were met 100%, but see the post update I made above. I’m still giving away 2 signed prints.